There are a few of these artists around the streets of London. Mostly you will find them in high tourist areas looking for a few coins for their work. How awesome to see this in person! I guess this is a way for artists to finance their travels. Otherwise there must be easier ways for people with that much talent to make a living. I know that drawing and painting outside is fun. If they just draw inside all summer then it will be really boring. The eye rises from the sea...I like it! 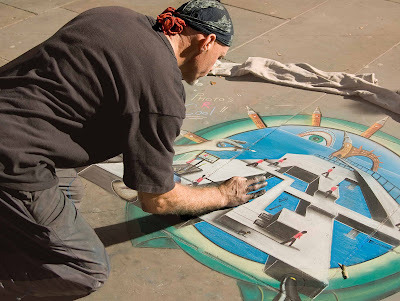 Have you seen the 3D pavement art that's doing the rounds on the Internet? They look really realistic and must have taken a lot of work to create them. I wish we had that here. I would send Gary out to do it. Oh how great! Reminds me of a scene in "Mary Poppins"! is this outside the national gallery?